Fullmetal Alchemist: Brotherhood’s characters struggle with guilt, regret, and lost humanity. It’s tricky to deal with the Japanese anime series Fullmetal Alchemist: Brotherhood. The review will focus on FMA: Brotherhood. But I’m not disregarding the original series. Although I think Brotherhood is a slightly better series overall, both are first-rate stories. When they are still young boys, Edward and Alphonse Elric plan to use their skills in alchemy to bring their dead mother back to life. But this act violates the rule of alchemy against human transmutation. In trying to perform this act, not only do they fail to resurrect their mother, but they also pay a harsh price. Edwards loses two limbs, an arm and a leg, and Alphonse loses his entire body, becoming a soul bonded to a suit of armor. A few years later, Ed joins the Amestrian military to become a State Alchemist. He thinks this will give him and Alphonse the chance to learn more of The Philosopher’s Stone–an object of great alchemical power that may help them restore their bodies. That’s story’s basic premise. But viewers quickly learn one great strength of Fullmetal Alchemist: Brotherhood. There is whole lot more going on, and the story dives into themes such as political corruption, personhood, genocide and revenge, immortality, guilt and redemption, and trying to play God. There’s even a bit of romance, if you’re willing to be patient with it. With so much going on, another tricky part is deciding what to write about. We could explore one secondary character, an Ishvalan man known as Scar. Given the corruption in the nation of Amestria, is his hunt for State Alchemists merely a revenge quest? Or is this the closest to justice that he and his people could hope for? Do his attempts to fight these State Alchemists–many of whom had been involved in the war to exterminate his people–make him a murderer? Or is he more like a gunman in a story of the old American west facing his enemies at high noon on the dusty streets of Dodge City? Or does he cross a line when he attacks State Alchemists who weren’t a part of that war? Or are the Elrics and their allies like Colonel Mustang–people who are committed to not killing other humans– hypocrites for allying themselves with General Armstrong and her soldiers from Briggs, because they are people much less hesitant to take lives when they think it necessary? Is it a strength or a weakness in the overall story that two such different ideologies about taking human life are presented on the side of the “good guys,” and neither is plainly supported or condemned? Then there’s Shou Tucker. He did one action that has made him, a very minor character, into one of the most hated characters in all of anime–though to be fair, he played a bit more of a role in the original FMA. Most of Fullmetal Alchemist: Brotherhood‘s main characters struggle with guilt and regret. Many of the military people, who were a part of the Ishvalan War, fight regret for their guilt of doing horrible things during that war. The Elric brothers know they are guilty of violating the rule against human transmutation, and they do not try to excuse their actions. Can these characters be redeemed? Not by the version of “God” the series portrays–that is, if we assume the entity several of the characters encounter at the gateway of truth is analogous to God. This being judges, takes away, bargains, and even seems to mock the humans. But he can also be beaten as if he were little more than the host of a TV game show. Thus the god of this series is not really a redeemer. He’s not a being who gives when the people have proven that they themselves have nothing to give back to him. He’s not a being who offers help to people who know they are helpless, or forgiveness to rebels, or life to the dead. Fullmetal Alchemist: Brotherhood is great, yet one of its best results is that viewers can find greater thankfulness: the true God is far better than the “god” of this series. View Fullmetal Alchemist: Brotherhood with discernment and wisdom. Keeping this in mind, go watch this series! It’s one that’s well worth seeing. And, contrary to my norm practice, I’d recommend watching it dubbed, not subbed. 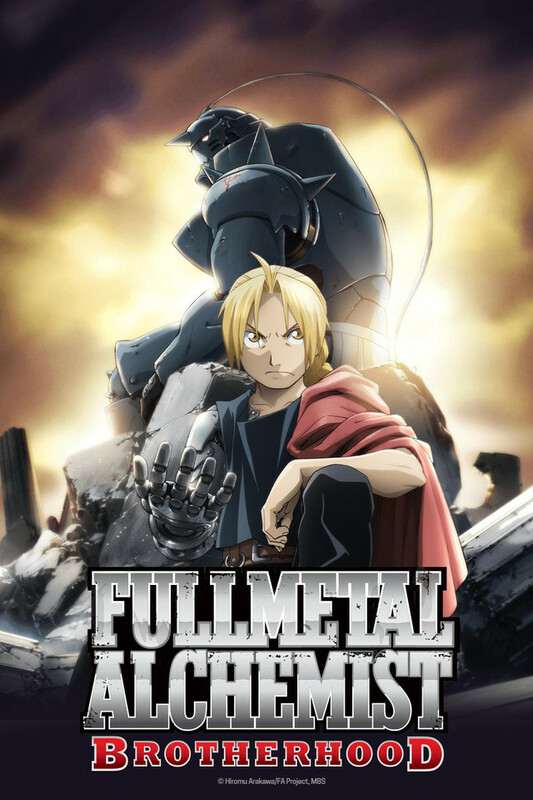 Fullmetal Alchemist is probably the best way to get started in anime, or to start others in anime. The western setting makes it more accessible to the noobs, but yeah, there’s a Japanese understanding of the world underneath it all. I’m a subtitle snob, too, but Funimation generally does an excellent job for dubbing. There’s a reason they’re one of the very few games in town for dubbed imports. I mostly favor subs, but there are a couple of exceptions. FMA is one of them, the other is Trigun, and I do notice that both have a very Western-like setting to them, though it doesn’t hurt that the dub work is also very good. And for Cowboy Bebop, the dub is arguably better than the sub, but it’s a very American kind of anime, if that even makes sense. I need to start CB again, it gets recommended a lot. I did see the movie, which was pretty good. I had so many friends who raved about FMA:B that a few months ago I decided to watch it. I got through about a dozen episodes and had to bail, because it was just too viscerally gruesome and violent for me (and I don’t consider myself particularly wimpy in that regard, either). I adored Al — what a shock to hear his voice for the first time! — and sympathized with Ed’s quest, and I could see there was a fantastically well-plotted and clever story behind it all, but in the end I was too haunted by the stuff I’d already seen to want to put more of it in my head. So yeah. Brilliant, but very much one of these Your Mileage May Vary things. Yeah, this show can give some serious gut punches. And it’s a little strange that the show has one better examples in anime of a father, as well as the worst. I’ll watch this series someday. I tried to watch the original series. I got as far as the episode with the little girl and the dog, and I was done. That part is in Brotherhood, too, which is the main thing keeping me from watching it. As a mother, it’s beyond horrifying for me. Brotherhood keeps the pace pretty tight so they can fit the whole story in 60-some episodes, so Nina shows up in Ep 4, IIRC. I can understand that. I don’t think the show in any way tries to either make light of or approve what happens in that scene. Still, that doesn’t make it any less an unsettling thing for anyone to do. Great review. I’ve only made it halfway through the series so far but all the themes you talked about a very evident within the first few episodes. I love how you brought out the theme of redemption and compared it to what true redemption means for the sinner. Thank you! Thanks, and hope you enjoy the series. It’s one of my favorites. I’ll admit this is the anime that made me like anime, and it was the third anime I’d tried. The first two were…well, Inuyasha is like the show that won’t commit and DeathNote….gets weird after the halfway point. (I got to Avatar later, and that’s western.) I watched FMA, then Brotherhood, back to back. I’ve watched a stack since, and so far still probably my favorite.